This entry was posted in Satire and tagged Scottish Stuff, funny and serious, summer, weather. Bookmark the permalink. I hope you are not too frivolous to bring an umbrella! Thanks for bringing YOU to my attention and leaving a comment, An E Cant. Seems the monsoon season is hitting Scotland and Southern British Columbia. What a treat to know that we are not alone…it’s been a very wet and cold spring. Summer, in name only, has not arrived! Our weatherman is threatening to put names to cold fronts! You won’t find this is in America. No, I guess Scotland is pretty unique in this way. But this is why we have lochs and mists and monsters and ghosts. 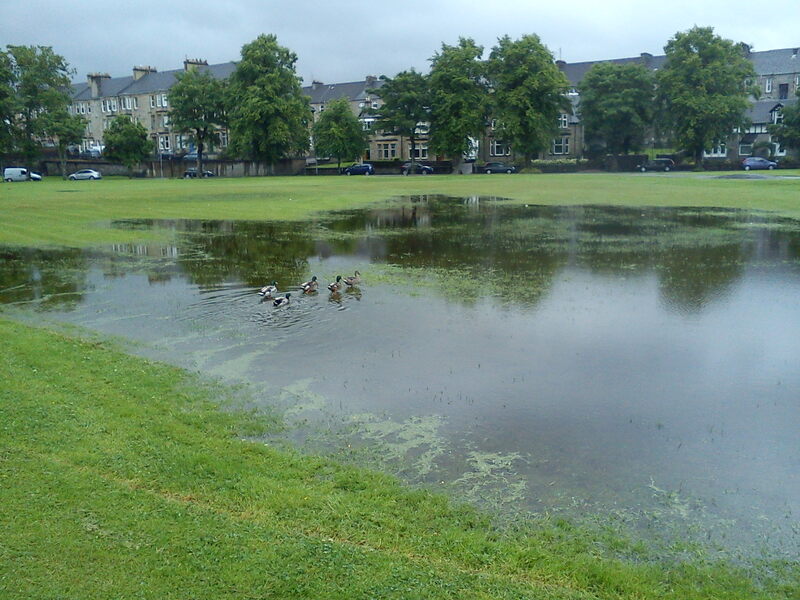 Wow….tons of rain than…makes for lush green, and very LARGE puddles for the birds..lol. Hope you are well Brian. Very well, thank you, apart from the rising damp …. I was outside for about 3 minutes this afternoon after working indoors for about 3 hours. While I was inside it was dry, as soon as I went out the heavens opened. Like a droont rat, as we say in Scotland!